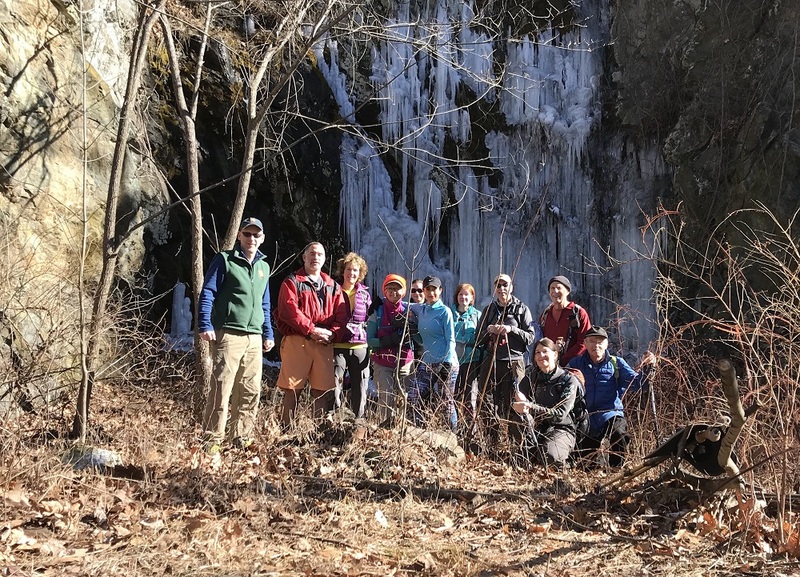 An adventurous crew of ten hikers joined hike leader Jeff Monroe on a beautiful January Saturday to journey to an old copper mine in the National Park. Included in the group were PATC veterans Marian Styles, Marie Moss, Pete and Bev Fink, Dave Borszich, John Brandt, and Michael Seth. 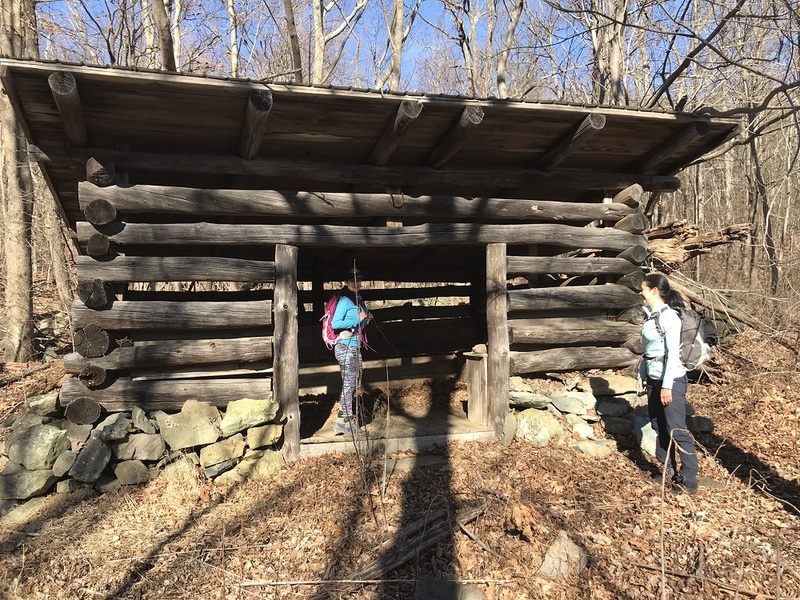 Also joining us for their second PATC hike were Gaby Novoa and Johanna Song, along with newcomer Jocelyn Prostko. The briefly shut down federal government had no effect on the hike, other than hastening access through the guard station. And there were very few other cars in the park. In fact, the entire group only saw a stray dog during the hike, and no hikers until they returned to their vehicles at the end of the hike. On the way to the mines, the group heard about this area’s brief time on the front pages of the local newspapers, when there was an explosion that could be heard all the way to Charlottesville. A later inquisition failed to determine whether the explosion and resulting deaths of three men was the result of an accident or something more sinister. 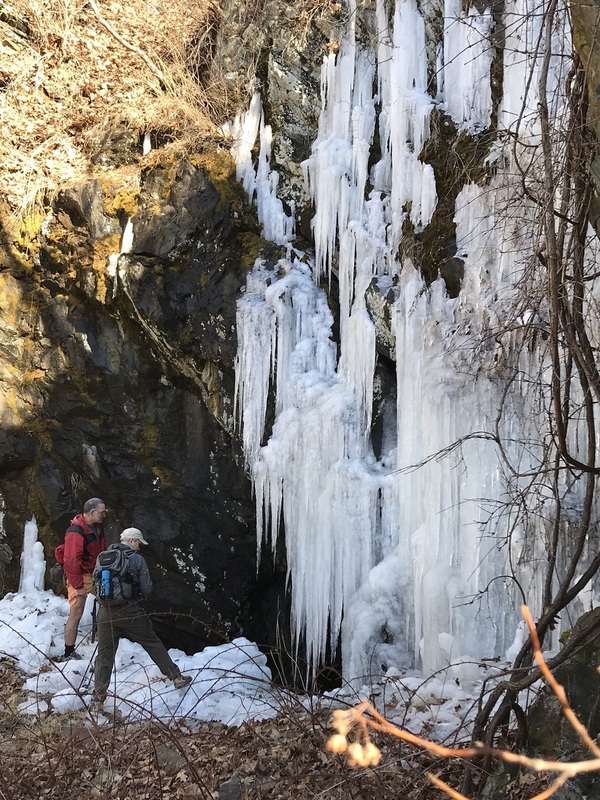 The mine itself looked more like a frozen waterfall. 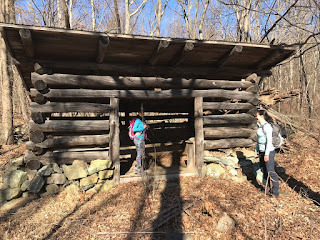 The group also visited an old trail shelter for AT thru-hikers, likely from the 1970’s or 1980’s, but long since fallen into disuse. 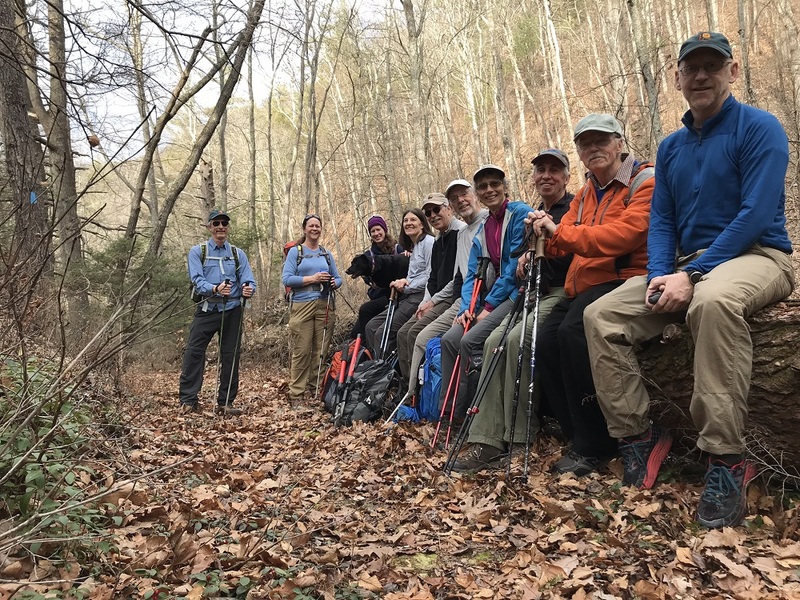 Overall the group traveled 8.4 miles before returning to the trailhead and taking the solemn vow to only show others the location of the secret copper mine in person – to keep it secret (and open) as long as possible. A good number of workers showed up to help clean up what is perhaps the least hiked trail in all of Shenandoah National Park – the Onemile Run Trail. Hike veteran Michael Seth told the group about hiking this trail one time and meeting up with a park ranger working along the trail – the ranger told Michael that he was the first hiker seen on the trail for the entire week the ranger worked. In addition to Michael Seth the group included replacement hike leaders Iva Gillet and Jeff Monroe, regulars Dave Borszich, Marie Moss, David Crowe and Bill Holman, first timers Steve Braintwain and Anna Castle, and Heather Rosso, who came all the way down from Reston to help the trail crew. Gabriel Garretson, the scheduled hike leader, was recovering from the flu. Feel better soon! 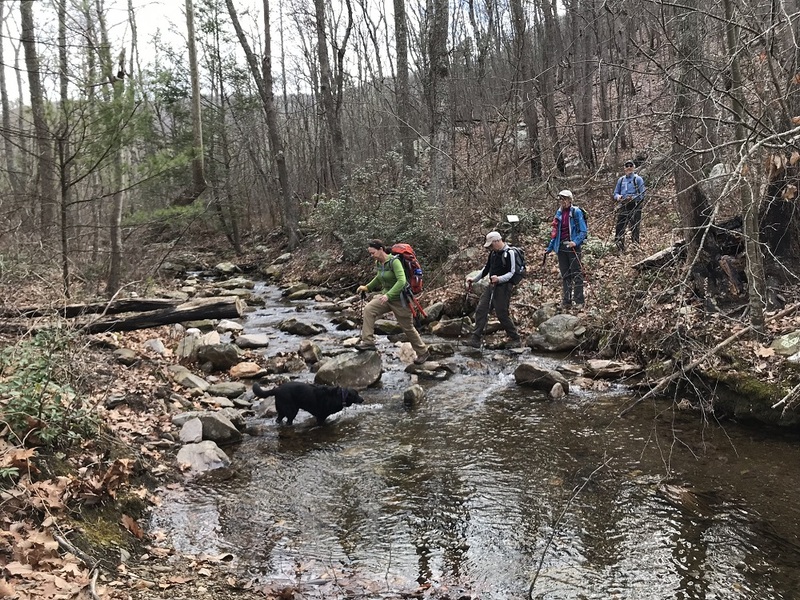 The group hiked to the national park border and cleaned up several large issues along the trail, crossing Onemile Run 13 times each way. There was much evidence of the April 2016 fire that swept through this part of the park, and no doubt continued trail work will be necessary in order to keep the trail clear. 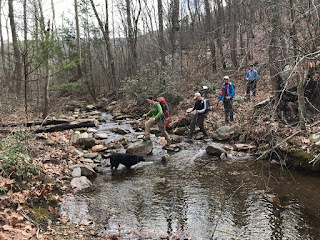 The group also hiked through a stand of hemlocks that were saved by the park from the Hemlock woolly adelgid by injecting trees with insecticide. 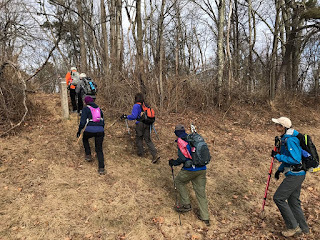 Upon returning to the trailhead, the group once again obtained cell service, and was excited to learn that UVA’s men’s basketball team had left Blue the Duke Devils in Durham while the group completed its trail work. DVRs are our friends! Only the hardy hikers showed up on this blustery winter day. While the seven mile distance was moderate, the morning was cold but sunny. 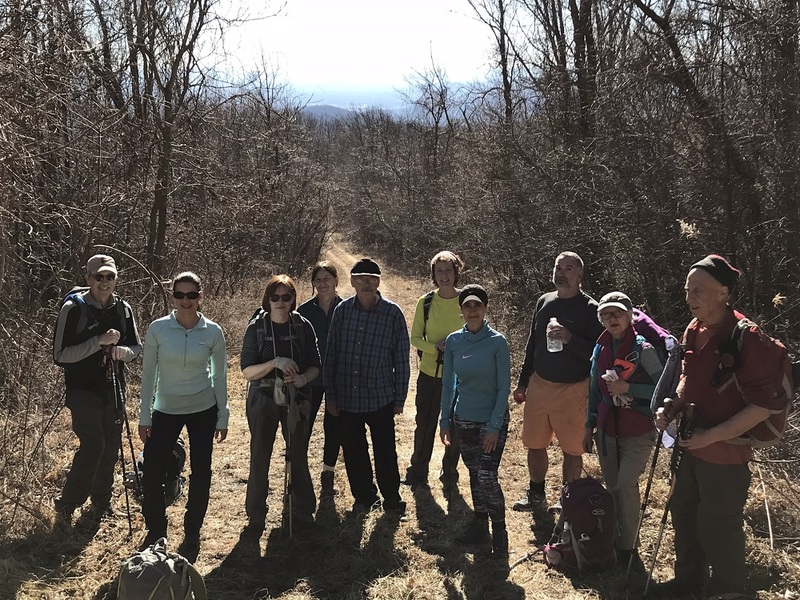 Only Marie Moss met Hike Leader Bill Holman at AHS, but we added David Crowe, CJ Woodburn, Nancy Handley, Dennis Templeton, and the other hike leader Iva Gillet (with Remi) at King’s Popcorn stand on Afton. We arranged ourselves into two cars and headed north meeting Kerem Coser and his co-worker Zach Bethune at the trailhead. Once introductions were made, we headed off at a brisk clip, with Remi leading the way. The AT and side trail to Blackrock parallel here, so there were options as we ascended to the summit. The view was spectacular, but so was the wind. Zach climbed on the rocks briefly and then we descended along the Trayfoot Trail, dropping us mostly out of the wind. 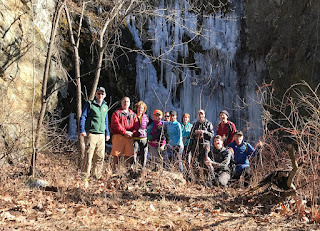 Bright blue skies shone as we hiked to the intersection with the Furnace Mtn Trail. CJ lead us, as we descended down, over rocks, and then through the woods with ridge line views in both directions. But wait! What do we see ahead, another hiker and it was Gabriel Garretson! He had hiked up the Madison Run fire road to join us. We convened at Furnace Mtn summit trail and then Kerem and Zach sprinted to the top. We passed a wonderful camping spot on the summit before descending to a rock large enough for us all to lunch on. Since it was in the shade, we ate quickly, shared lots of chocolate, and then retraced our steps. Gabriel turned back down the mountain while the rest of us hiked back up Trayfoot Mountain. Back to Blackrock summit- it was still windy- so again we didn’t linger and headed back to our cars along the AT. A note on our cars indicated that Clair Cline and Ann Colgate had tried to find us, but were on the windy AT instead. As a final activity for the day, several of us drove into Waynesboro for snacks, beer, and conversation at the Seven Arrows Brewery. Sitting there by the fire, we were pleased to have had a fine hike in the Shenandoah Park on such a beautiful, but cold and windy day!